A woman's ability to conceive in early middle age may be influenced by her blood type, according to research. The US study of 560 women undergoing fertility treatment found that those with type "O" blood had chemical signs linked to low egg numbers. There is no clear explanation for the results, presented to the American Society of Reproductive Medicine conference in Denver. Approximately 44% of the UK population has type "O" blood. The researchers, from Albert Einstein College of Medicine in New York, and Yale University, looked at the levels of a chemical called follicle-stimulating hormone (FSH) in the women, who had an average age of 35. A woman has a fixed number of eggs, her "ovarian reserve", which are released gradually over her fertile life. High levels of FSH are thought to be an indicator that this reserve is diminishing more quickly - which can reduce chances of conception once a woman reaches her 30s and 40s. Analysis of blood samples revealed that the women with type "O" blood were more likely to have higher FSH readings. 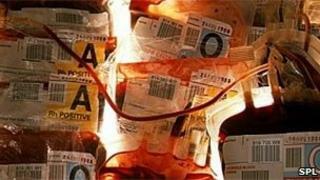 Those with type "A" blood - the other major blood group in the UK - had lower FSH levels. Dr Edward Nejat, who led the study, said: "A woman's age remains the most important factor in determining her success of conceiving. Whether or not this will make any difference to women in the general population is not clear - all the women in the trial were already seeking fertility treatment. Tony Rutherford, chairman of the British Fertility Society, said the research was "interesting". He said that further larger-scale research would be needed to both confirm the result, and see if an effects could be spotted in women with no diagnosed fertility problems trying to conceive. "This is the first time that I'm aware of that the researchers have shown a link between blood group and potential for fertility. "We really need to look at it with other, more up to date tests of ovarian reserve - and to look at a prospective group of women to see if blood group affects your chance of getting pregnant."